External signs of maggot infestation appear as pinpricks made on the apple surface. These are often small, distorted or pitted areas. These small dimples and depressions appear where females insert their eggs under the skin of the fruit. Apples infested early in the spring will appear bumpy as they mature. 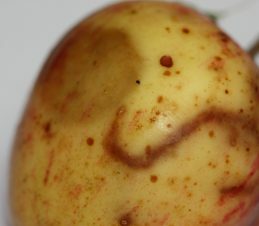 Larvae feeding damage appears as distinctive brown tunnels meandering through the flesh of the fruit. Heavily infested fruit can become mushy and prematurely drop. The majority of maggots leave the fruit several days after it has fallen from the tree. As a result, a certain level of control can be achieved by picking up and discarding the dropped apples. SIR and the CFIA (Canadian Food Inspection Agency) are surveying for apple maggot in the Southern Interior in 2016. Get in touch if you would like to find out more about this program.